A few years back, there was a restaurant called Chicken Kitchen located about 5 minutes from my house. They served up some great spit-style chicken in a bowl called a Chop-Chop. Piled high with black beans, lettuce, salsa and cheese, these Chop-Chop’s were amazing. Mommy and I used to visit this place all the time. Bad thing was, we were probably the only people who did. The location closed and we were years without another option. Then, Pollo Tropical opened not 1 but 2 locations in Naples. Bad thing – they were both about 30 minutes from our house. Well, a few weeks ago, we finally made a trip out there. Someone please, please, please tell me why it took us so long to visit? Trop-y-Cal I have found me some love. Upon entering Pollo Tropical (which I pronounce as Trop-y-Cal) you are greeted with bright colors and lovely atmosphere. On all 3 occasions that we have visited – all within the past 4 weeks mind you – the service has been killer. After reviewing the menu, I opt for, and thus always opt for, the Tropichop. 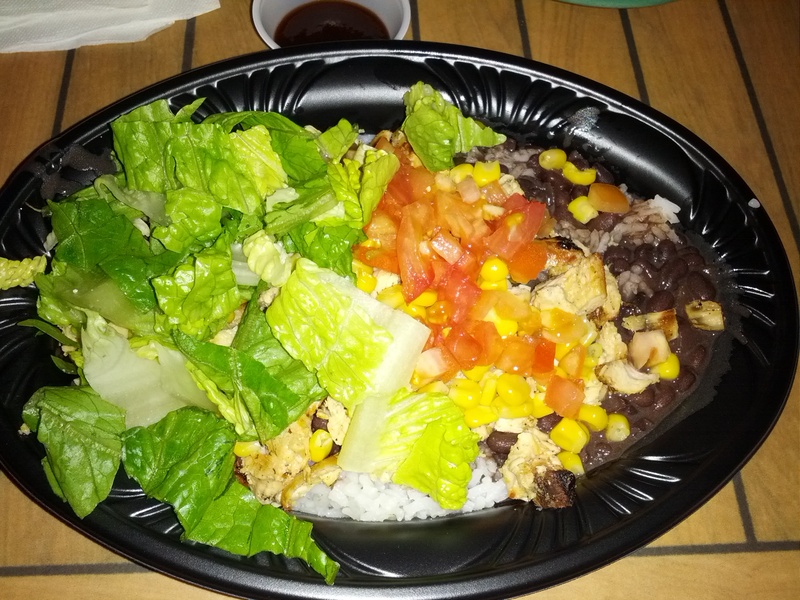 I start off with lettuce, white rice, black beans, chicken, tomatoes and corn. You receive a number and find a table. 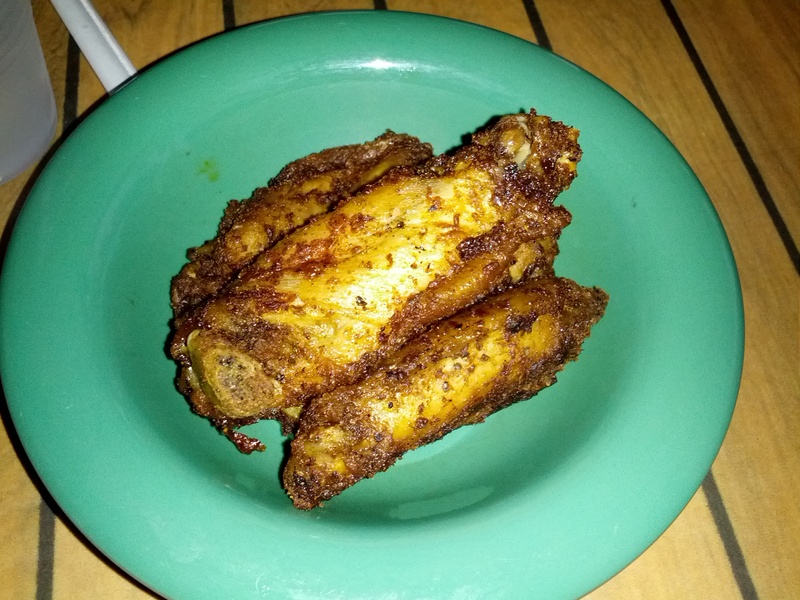 On our first 2 visits, we also tried a few of the Grilled Wings. Once our food was brought to the table, I wanted to dig in right away. The bowl is beyond full of everything and smells divine. I first mix everything around and then dig right in. Let’s work from the bottom layer up. I have tried both the white and brown rice and find I prefer the white rice. It is sticky, soft and has just enough flavor. It allows all of the other flavors to work with it. The beans are probably the best black beans I have ever had. Every single bite produces the fantastic flavor which is not at all salty and just soft enough. The lettuce, tomatoes and corn are all very fresh and crisp. As for the chicken, it has a great fresh taste to it. It is cooked right behind the counter, in front of you, on a grill. Every single piece has a slightly charred/crisp outside while still managing to maintain a moist interior. It is hard to describe exactly what the chicken tastes like since the flavors are so simple. Delicious is a good way to describe it. I also really like the grilled wings. These have some flavors of cinnamon on the exterior and a juicy, moist interior. I enjoy dipping these into the Classic BBQ Sauce. While this may be called Classic, I would describe the flavor as more Tropical than Southern. The bbq sauce has some sweetness in it but, is primarily full of a mixture of spices. This produces a gritty like texture which I quite enjoy and the flavor is neither sweet nor spicy. I’m not sure if I would like this sauce with other items but with my Trop-y-Cal, it is just perfect. As I mentioned, I’m not sure why it took us so long to finally make it to Pollo Tropical. I now need to make up all of the lost time and visit on a weekly basis. You leave, completely full and satisfied – not needing another bite. In addition to the great service, the price is unbeatable. You receive the huge Regular size Tropichop for 6 bucks. And I mean, this is a meal. Plus, if you are eating at the restaurant, you can add-on a drink for only $1. I plan on returning back over and over again to Pollo Tropical and you should do the same. Just be sure you remember…it is pronounced Trop-y-Cal. Omg Kelly you have no idea. Its our new favorite place to go!! !